Dr. Montessori realized that there is a great benefit to “educating the senses” as a means for making the child’s senses more usable. 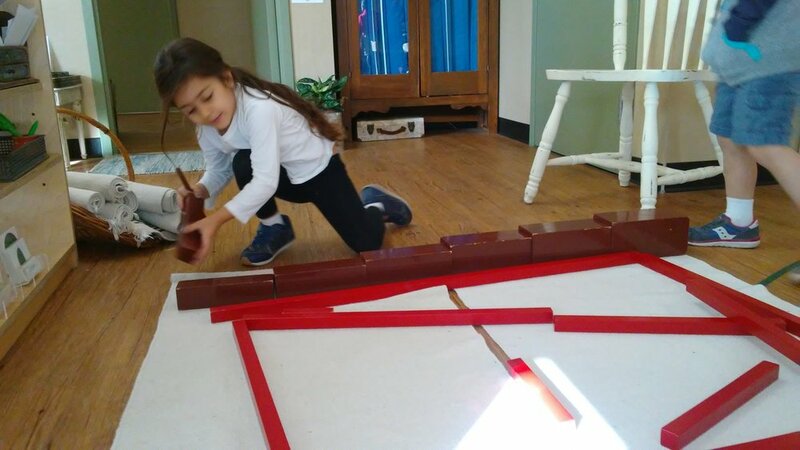 Through her explorations she concluded that the sensorial exercises are the child’s sensory link to the outside world. The 5 senses are receptors for information and the child uses their senses to absorb qualities of everything around them in their environment. The sensorial materials allow the child to absorb the abstract qualities of everything through his senses. The isolation of quality is designed this way so that the child focuses his mind on that particular quality that is isolated. For example, the Pink Tower has an isolated quality of size only as every cube of the tower is pink. Every activity in the sensorial area offers the child the ability to manipulate it and is able to work with his hands. This helps to focus on a particular isolated attribute and through this manipulation the child can make comparisons and studies of the qualities. Materialized abstractions are the qualities that our senses are taking in that do not exist by themselves. For example, the tasting bottles are neutral because they all look the same. They are “tastes” that are all contained in the same looking container. The abstract quality has been materialized in a way that the child focuses all the attention on that particular quality: sweet, salty, bitter or sour. There is no food item to deter his other senses. The control of error is built into the material to indicate to the child if he is on the right track or not. For example, the cylinder blocks will all only fit into their correct spots if the work is done correctly. This allows the child to be independent in correction as he goes along, making it much more gratifying than having an adult correct him. Each sensorial material is scientifically precise and has been designed with mathematical precision. An example of this can be shown as each of the Red Rods increases by 10 cm. This adds a bit of mathematical absorption through manipulation. All of the sensorial materials are attractive, beautiful and inviting and they are limited in number to encourage a 3-step work cycle. There are 5 key purposes for the sensorial materials. 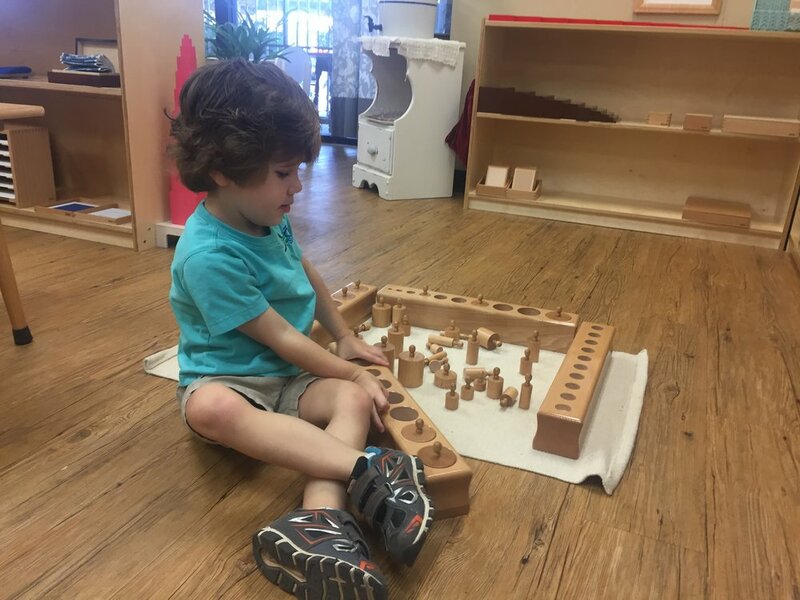 The classifications of impressions leads to intelligent explorations and the child can explore things and attach conceptual things to what he’s learning. The recall of precise qualities ensures that the child is taking in something that through the senses that reminds them of something else. These materials cause the mind to be orderly. 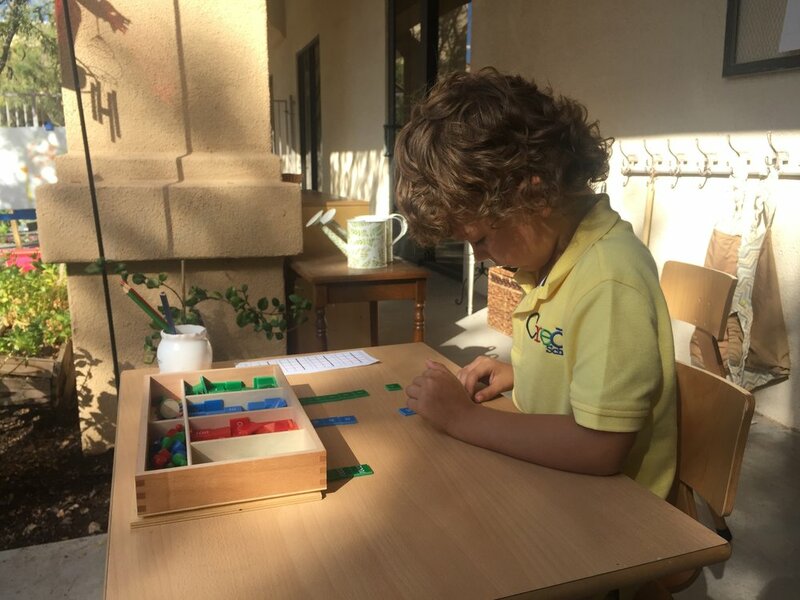 By doing this, the child has greater clarity of thought, a more refined observation, and a tendency for precision, which is important for later work. The development of an aesthetic sense supports the child in developing an eye for harmony in the world around him albeit visual, physical, or acoustic harmony. In order to see harmony our senses have to be very keen to be able to develop a sense of beauty and artistic creativity. This supports the child’s ability to move from a concrete understanding to an abstract understanding. The sensorial materials are also an indirect preparation for future learning in such disciplines as mathematics, botany, zoology and geology. 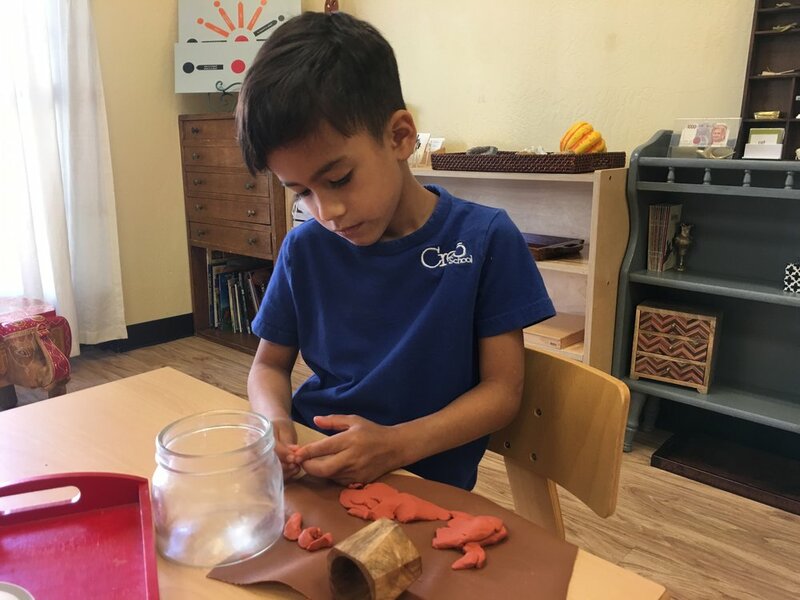 Art is a form of personal expression in the Montessori Children’s House. Creativity allows us to express what’s in our mind in different formats. We have visual, music, words and drama as different types of art. Art should be present in the whole environment. There should not be a designated classroom for art where everyone is doing art together. We want to maintain a level of aesthetic beauty in the classroom by hanging artwork all around the environment at the child’s level. In the reading corner we want quality books with nice illustrations that are grounded in reality. There are many reasons why it is important to offer art in the Children’s House. By doing this we offer the child an opportunity to express something in a creative ways. Their control of movement results from proper technique and quite often leads to intense concentration. Art helps lead the child to refine his observations. When children get a little older, engaging in art helps them to observe better. They are able to take his abstract knowledge and make it into something concrete. Art expression is a direct reflection of the child and art is the communication of his personal feelings and thoughts. Manipulation of clay to strengthen fingers and to construct geometric solid shapes. Helps the child to recognize different forms of leaves and stimulate interest in nature study. A triangle-shaped box containing one large equilateral triangle, 4 small equilateral triangles, 3 isosceles triangles, and 2 right-angled scalene triangles, with black line on some of the sides. The child uses the smaller triangles to make larger triangles. Refinement of the thermic perception through awareness that different substances at the same temperature have different apparent temperatures due to their heat conducting properties. Visual discrimination of dimension; size and thickness with an indirect refinement of voluntary movement. Refinement of the child's olfactory sense and to develop his awareness of scent in the environment. Indirect preparation for mathematics: the cube of a trinomial (cubing a quantity with 3 factors) and preparation for cube root. Develops visual sense for the discrimination of size. Develops the child's awareness of the four fundamental tastes: sweet, salty, sour and bitter. Visual discrimination of dimension; length and an indirect preparation for mathematics. To help the child become aware of the solid geometric forms around him and labeling the name of each solid. Visual discrimination of dimension and an indirect preparation for handwriting through the 3 finger pincer grip of the knobs. The study of Geography of Europe: labeling each country and learning their corresponding flag. To build the puzzle known as the trinomial cube with preparation of future geometric studies. To give the child the keys to the world of color and to help develop the chromatic perception of colors in our world. To give the keys to the world and to help the child to develop the chromatic perception. Yay! Fall is finally here and we get to spend more time outside. Our pumpkin plant has numerous blossoms on it and we are anxiously awaiting the next stage, the green pumpkin. We are keeping our fingers crossed that it delivers. We were so lucky to already harvest five eggplants this month and we planted some marigolds as well. This has been a very exciting and busy month with parent observations and celebrations. It's been so wonderful to have all of you parents in our environment to see where all the magic happens. All of the children were just so super excited to show off their classroom and to be able to show their serving skills. The auction was a grand success and for that we extend our greatest thanks! After learning about the parts of the pumpkin and its' life cycle, we baked our own pumpkin pie. Acquiring names of leaf shapes through the use of three part cards. Helps child to develop hand-and-eye and fine motor coordination while learning independence by tying his own shoes. Helping little hands and fingers to get strong while refining fine motor skills. To help the child become aware that adjectives can single out an object from the group and practice with reading. Developing love and respect for the environment through gross motor skills. To familiarize the child with the essential multiplication combinations. To give the child an opportunity to to work individually with division problems that have a remainder. Learning geography and facts about our 50 states. Practice with handwriting as the child writes the recipe after baking, so that they may use the recipe to recreate at home. A place where children can discover items through the use of a magnifying glass. This month we have gourds, pumpkin seeds and stem and acorns! To see how the notes of the staff can be translated into scales or melodies. Practicing cursive with the new sounds we just learned! Tools for further exploration of child's own language and gives more keys to reading. Helps strengthen hand/eye coordination and fine motor skills. November has been a wonderful month. We have certainly noticed attitudes of gratitude permeate throughout the community. This truly began with our Charity Event! It was evident how much we all appreciate this special community we call Creo. Thank you, on behalf of the children, for your donations and attendance that evening. I also want to thank all of the parents for attending our classroom meeting this month. It was wonderful to watch you all experience the Sensorial Materials first hand. Along with giving thanks on our mind, the children have enjoyed welcoming another new friend into the environment; Banks, we’re delighted to have you! The children have been enjoying learning about Native American culture this month. In addition, we have continued discussing parts of the pumpkin, and recently, parts of the turkey and acorn as these are notable to the children during autumn. They have discovered and collected a whopping 247 acorns during our nature walks. This fact has been determined and labeled on our ‘museum table’ by a group of clever five-year-olds who grouped them into piles of ten and skip counted the quantity. It is such an honor to sit front row on this beautiful exploration bus. Our CH level also switched our recipe from Banana Muffins to Sweet Scones. We hope you enjoy them during your observations! "And this is where we live..."
Puzzle map that displays the political divisions of the child's home country. This picture shows an older child teaching a younger child the names of the states. Two friends work together to further their memorization of the essential addition combinations. A great way to practice three finger grip while expressing herself through art. Releasing the albino Praying Mantis back into nature. Learning that two sounds together can make a new sound! To give the child the symbols for the sounds of his own language by means of three senses: touch, vision, and hearing. The child utilizes the dictionary to correct her spelling of new words. The children read the new recipe. The child receives a lesson on the vocabulary for numerators and denominator after naming the fractions; discovering the relationship between fractions and whole numbers. The child carefully decodes the division word problem to accurately find the quotient. The child observes an albino praying mantis on the museum table. What a wonderful time of year!!!! This month’s topic is so appropriate for this time of year. In my opinion, there is no other time of year that evokes the senses and folds them into life long memories. The smells of the crisp fall air, the taste of Grandma’s sweet biscochitos, the feel of snow between your fingers, the sounds of holiday greetings, and the sights of all the beautiful colors of the season. These are just a few examples of how our senses can transport us back to a fond memory or time of life that is precious to us. Use this time to create life long memories for your child. Our garden has been transformed. The children are working hard to keep the garden alive. They are busy watering our many plants, discovering the buds on the bell pepper plants, enjoying the cool weather, and listening to the birds sing while sitting under the shade tree. And soon, they will be able to appreciate the sounds and sights of their beautiful work on the class fountain!!! A big thank you to the Shah family for donating the class art auction project to the classroom. We love it!!!! In the classroom, we have been discovering the many varieties of apples, the parts of the apple, and all the wonderful tastes of each one. Baking blueberry muffins is one of the highlights of the sun celebration. It engages the child in measuring skills and large and fine motor skills. Here, the child is making the association between the symbol and quantity of the numbers 11-19. Folding the lunch napkins is a daily ritual. 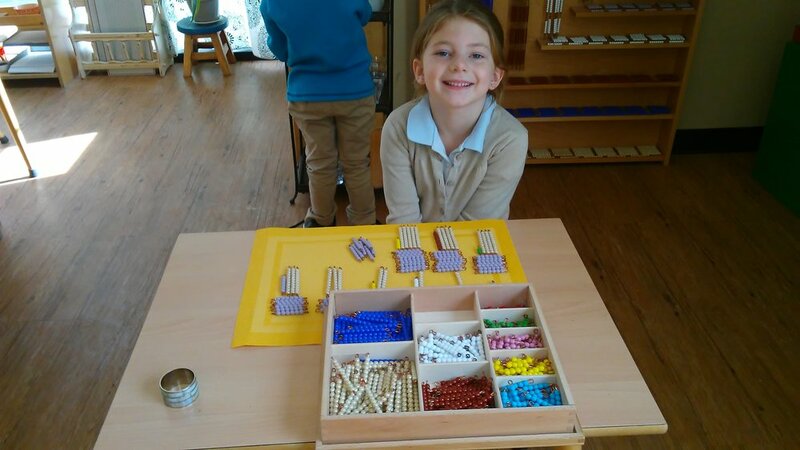 This activity enables the child to practice coordination, concentration, and a sense of order. Children love baking for their friends to share during the sun celebration. Cooperative learning is key in this activity. Learning to write on the chalkboard works the child's fine motor skills, lightness of touch, letter formation, and a sense of accomplishment. Mastering the long 6 chain. 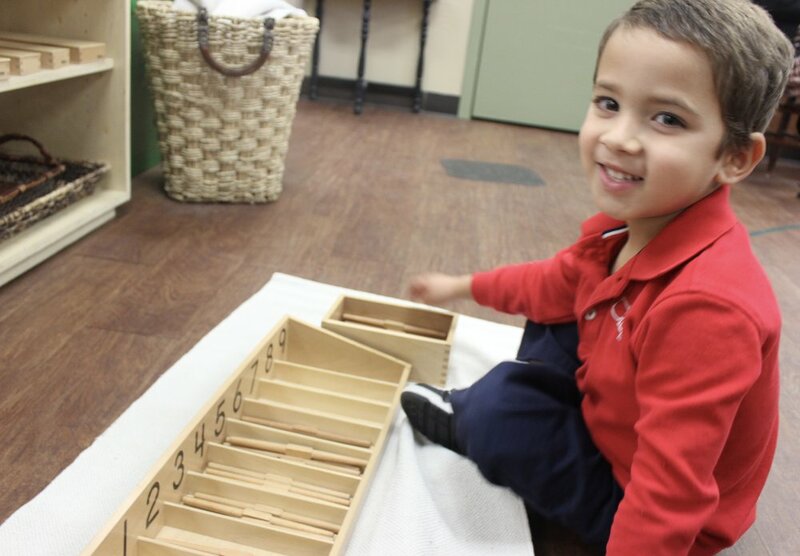 The child practices skip counting, fine and gross motor skills, sense of order, and coordination. Preparing beautiful bouquets of flowers to brighten the environment engages the child's visual harmony, fine motor skills, and sense of order. This language work encourages the child to read. It exposes the child to the skill of rhyming. This child is on her way to abstraction with the addition math facts. This child enjoys putting together the map of the United States outside it base. The child not only learns the names of the states but allows for concentration and visual harmony. Preparing the placemats for ironing not only requires eye and hand coordination but also concentration. 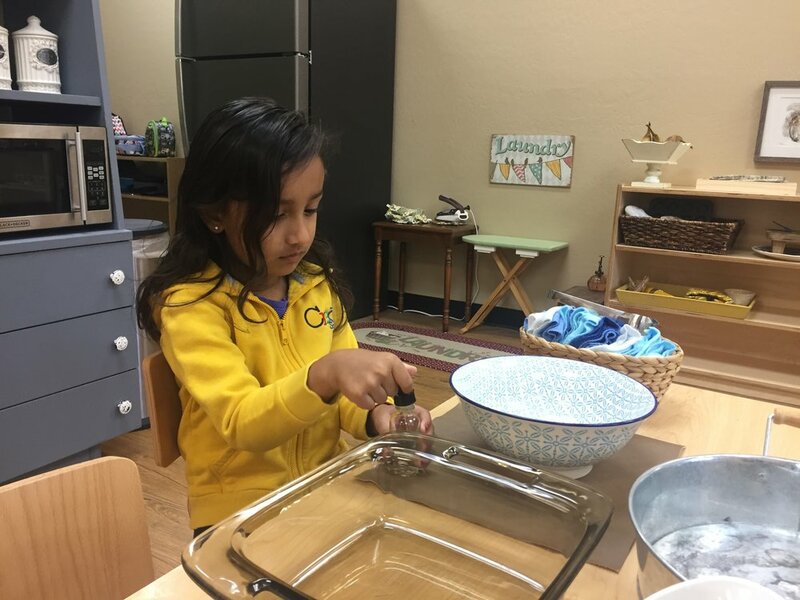 Children love to help prepare the items used for lunch. Concentration and fine motor skills are key for the younger child. Here, the child has progressed to an utilitarian need to accomplish the work. These children are working together to put the dishes away. Coordination, cooperation, order, and gross and fine motor skills are used with this activity. Water color projects are an expression of the self. It gives the child a sense of accomplishment, visual harmony, and works the use of fine motor skills. Stacking the dolls is not only enjoyable but also helps with coordination, concentration, and turning chaos to order. What a great month to connect with all the parents. Thank you to all of you for attending observations as well as parent education night. We enjoyed having you over in our environment and sharing with each of you some highlights of your child’s days at school. The auction was a great success, thank you for all constant support! With the weather getting cooler the children spend more time working in our outdoor environment. We are starting to see little signs of growth in our garden. The children love to water it and take care of it. This month we also read about the story of Thanksgiving and gave the opportunity to each child to share what are they thankful for…the answers go from cute and beautiful, to funny and unique! Well let me just say that we are thankful for each and one of your children for bringing so much happiness to our lives.